If you’ve kept your eye on the news since 45’s inauguration, it’s frighteningly obvious the environment needs our help more than ever. From calling climate change a hoax to massive budget cuts for environmental agencies and programs, green-lighting the Dakota Access Pipeline and asking the EPA to reconsider the Clean Water Act, we, as individuals, might just be the last line of defense. For those of us hungry for change, there’s a few ways we can eat our way to a better world—or at least try. We have the power to fight back with our stomachs, plates, knives and forks by choosing the foods we spend our money on and put in our mouths. This is by no means a definitive list, but it’s a start. Remember, America is a country of supply and demand, so if you don’t see environmentally-friendly items on the menu or on the shelves, ask for them—repeatedly. Whether it’s to take on global warming or make a dent in that feisty invasive species, we can actually help save the world, one bite at a time. The venomous spines of a lionfish may look majestic behind the glass of an aquarium, but this invasive species, native to the Indo-Pacific region, has quickly taken over the east coast reef systems of North America. With no natural predators and an undiscerning appetite for anything that will fit into its mouth, the lionfish is rapidly reproducing and decimating up to 95 percent of native Atlantic and Caribbean Sea reef populations. Lucky for us, they are delicious, and our plates have the power to help rein in these self-appointed Kings of the Reef. Likened to snapper, grouper, and sometimes, even lobster, you can catch a taste of this prickly predator on menus from Panama to New York, or pick it up fresh from select Whole Foods stores. Unlike most plant-based food products, Impossible Foods’ target demographic isn’t vegans or vegetarians—it’s meat-eaters. It’s no secret the meat and dairy industries are destroying the environment, but that didn’t stop us from shamelessly choking down 214.3 pounds of meat and 627 pounds of dairy per person in the U.S. during 2016 and 2015, respectively. Why? Well, finding suitable substituted has seemed near impossible—until now. Enter the Impossible Burger, a plant-based, bleeds-like-beef product that browns, sizzles, feels, smells, and, by all accounts, tastes like the real thing. Gorge guiltlessly knowing that it emits an eighth of the greenhouse gases and requires just a fraction of land and water compared to animal-based beef burgers. You can taste the future at 11 restaurants scattered around NYC, Los Angeles and the Bay Area, though the company hopes to expand to 1,000 restaurants by the end 2017. 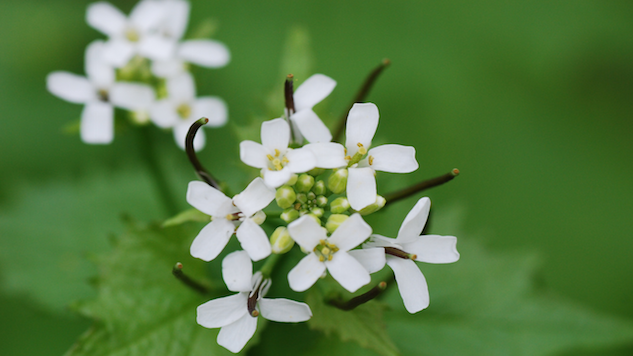 These days garlic mustard (Alliaria petiolata) is considered a pesky, hard-to-eradicate wild weed whose toxic roots poison the soil for native plants. Most people just mow over it without a second thought. But, for the early European settlers responsible for introducing the plant to North America, it had many uses. They used it to battle erosion, treat ulcers and gangrene and as a tangy, garlicky cooking herb that supplied a healthy dose of vitamins A and C. One of the only ways to be sure the tenacious plant can’t reseed is to isolate and dispose of it completely. Our stomachs seem like the perfect place. The entire herb, from root to flower, is edible, making it a delicious and easy-to-forage addition in everything from sautés to soups to salads. Chances are, it’s right in your backyard. Eating insects isn’t new, but it’s becoming more and more of a reality. As global population soars, so do concerns and debates over how we can sustainably continue to feed ourselves. Many experts feel that insects—high in protein, diverse in flavor and simple to farm—are the solution, though many countries, including Mexico, Australia, China and Thailand, have been eating insect dishes for ages. For a slow intro, hop into one of the many restaurants across the U.S. that serve chapulines, aka grasshopper dishes, like Washington D.C.’s oyamel. Native to Eurasia, wild boar and feral pigs are some of the most destructive invasive species in the U.S. They are rowdy bullies who tear up land, carry disease and push out native species in 39 states. In Texas, the problem is so out of control that hunters get year-round, free reign to capture and kill the pigs. Despite its popularity on menus across the country and large culls via helicopter, we’re barely making a dent in this persistent pig population. Adding recipes for these hogs into rotation at home may help. Broken Arrow Ranch is a major supplier of wild-trapped boar meat and has an online store where you can pick up different cuts. These little legume seeds are the ultimate unsung superfood. Not only are they packed with fiber, anti-aging properties, protein and other nutrients, but they have the lowest carbon-emission from soil to table. A part of the pulse family, lentils are a rotating crop with the ability to fix and replenish nitrogen in soil, helping to reduce the carbon footprint of other crops and greenhouse gases by replacing synthetic fertilizers. We also see a reduced level of methane gas when pulse by-products are used in livestock feed. As if that weren’t enough, lentils are an incredibly versatile ingredient that’s easy to find, easy to prepare, and easy on the wallet. Altogether, that’s more wins than we can fit on one plate. If you aren’t feeling adventurous or just don’t want to change up your diet, the easiest and most effective thing you can for the planet is to eliminate your food waste. The U.S. is responsible for 72 billion pounds of edible food waste each year. That’s roughly enough to fill the bellies of 36 to 49 million people on a daily basis, essentially covering the 42.2 million Americans in “food insecure” households. While a lot of that waste occurs before the food even hits our plates, most of us are guilty of wasting food. At the very least, keep eating what you’re eating, but try not to over-buy at the grocery store or over-order at restaurants, and take home leftovers. It’ll help keep down carbon emissions of food waste decomposition, save space in landfills, chip away at the $218-billion-dollar food waste deficit and ensure the earth’s resources aren’t used in vain. Katherine Alex Beaven is a Brooklyn-based freelance travel and food writer with a weakness for flight deals and mac ‘n’ cheese. Hit up Instagram to see where she is and what she’s eating.